All of the American Indians believed strongly in good and bad medicine. “Medicine” could mean physical items used to cure illness and injury or it could have a more spiritual meaning represented by objects that could protect or predict good or bad occurrences. Small personal medicine pouches or large tribal medicine bundles were extremely important and were shown the utmost respect and care. 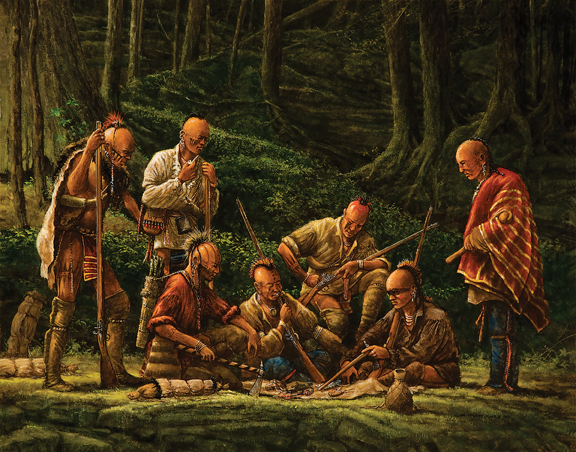 “War Bundle” shows a group of warriors attentively observing their leader as he opens and consults the medicine in his war bundle. He has led them into enemy territory on foot, so that discovery by the enemy is less likely. Their objective is to attack a small encampment of enemies, count coup or kill and scalp as many as necessary, plunder their possessions and capture as many of their horses as possible, then ride swiftly out of danger back to their own territory. If they are successful, they have performed a brave and honorable deed; something to be proud of for the rest of their lives. Even though they may have traveled hundreds of miles, a bad dream or bad medicine could cancel the entire event and send them home empty-handed. Everyone could express his own opinion which was given full consideration as to whether the raid should proceed or be cancelled.